Our company, Farata Systems is big supported of open source and developers community. Farata’s engineers are recognizable speakers huge numbers of conferences (JavaOne, Adobe MAX, AJAX World, SOA World, Devoxx, 360Flex, etc). Farata also sponsors local community and meetups, e.g. 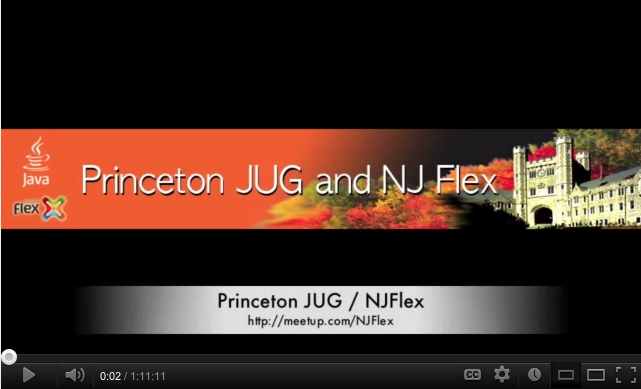 Princeton JUG and NJFlex. We bring remarkable speakers to talk about topical problems, innovations in the Java world and industry in general. Last time (September, 28 2012 ) we hosted very energetic gentleman from Israel-based startup JFrog – Baruch Sadogursky. At this talk Baruch did great introduction to 101-cloud platform for Java engineers. He did an overview of common technical solutions, what platform to choose, how to get win in «Cloud Bingo»! If you planning to move you app to the Cloud tomorrow what this video today to avoid common problems and pitfalls. This entry was posted in Java and tagged Cloud Computing by Viktor Gamov. Bookmark the permalink.